1. What is a Report? A report is a nicely formatted way of presenting the data that you have entered. Reports are all about querying a database and displaying the results in a nice format. 2. What is Jasper Report? Jasper Reports-the heart of iReport is a content-rendering library, not a standalone application. It cannot run on its own and must be embedded in another client- or server-side Java application. The Jasper Reports library is a very powerful and flexible report-generating tool that delivers rich content to the screen, a printer, or a file in PDF, HTML, RTF, XLS, CSV or XML format. The library is written entirely in Java and can be used in a variety of Java-enabled applications, including J2EE or Web applications, to generate dynamic content. Its main purpose is to help to create page-oriented, ready-to-print documents in a simple and flexible manner. 3. What are the features of Jasper Reports? 1. Has flexible report layout. 2. It can present data textually or graphically. 3. Developers can supply data in multiple ways. 4. It can accept data from multiple datasources. 6. It can generate subreports. 7. It is capable of exporting reports to a variety of formats. iReport is an OpenSource program that can create complex reports which can use every kind of java application through JasperReports library. It is written in 100% pure java and it is distributed with its source codes according to the GNU General Public License. It is a visual tool to obtain XML files for JasperReports. It provides a WYSIWYG environment to design reports. 5. What are the different ways to use iReport? 6. What are the elements of report template? Following is the description of each element. Title contains the title of the report. It appears only once at the very beginning of the report, for example, "Tutorials Point Report". PageHeader may contain date and time information and/or organization name. This appears at top of each page. ColumnHeader lists the names of those specific fields which you want to display in the report, for example, "Author Name", "Starting Hour", "Finishing Hour", "Hours Worked" and "Date" etc. Detail is the part where entries of the specific fields (listed in columnHeader) are shown, for example "Manisha", "9:00", "18:00", "9", "10.02.2013". ColumnFooter may display summation of any of the fields, for example, "Total Hours Worked: 180"
PageFooter may contain page count information. It appears at the bottom of each page, for example, "1/23". Summary contains information inferred from "detail" part, for example, After the number listing of worked hours for each author, total hours worked for each author can be put in visual chart like pie chart, graph, etc for better comparison. 7. What are the main inputs required for report-filling process? · Report Parameters These are basically named values that are passed at the report filling time to the engine. · Data Source We can fill a Jasper file from a range of datasources like an SQL query, an XML file, a csv file, an HQL (Hibernate Query Language) query, a collection of Java Beans, etc. 8. What are Reports Parameters? Parameters are the object references that are passed during report-filling operations to the report engine. Parameters are useful for passing useful data to report engine, the data which cannot be passed through the datasource. Data like author name, title of the report etc, can be passed through parameters. A Jasper report template or JRXML template can have zero or more parameter elements. 9. What are Report Data Sources? Datasources are structured data container. While generating the report, Jasper report engine obtains data from datasources. Data can be obtained from databases, XML files, arrays of objects and collection of objects. 10. What is Reports Fields? Report fields are elements which represent mapping of data between datasource and report template. Fields can be combined in the report expressions to obtain the desired output. A report template can contain zero or more <field> elements. When declaring report fields, the data source should supply data corresponding to all the fields defined in the report template. 11. What is Report Expression? 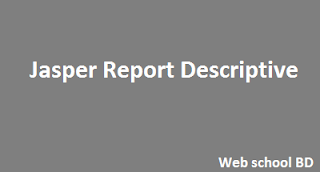 Report expressions are a powerful feature of JasperReports, which allows us to display calculated data on a report. Calculated data is the data that is not a static data and is not specifically passed as a report parameter or datasource field. Report expressions are built from combining report parameters, fields, and static data. 12. What are Report Variables? 13. What is the function of report groups? Groups in JasperReports help organize data on report in a logical manner.A report group represent a sequence of consecutive records in the data source that have something in common, like the value of a certain report field. A report group is defined by the <group> element. A report can have any number of groups. Once declared, groups can be referred to throughout the report. 14. What is subreport in iReport? Subreports are one of the nice features of the JasperReports. This feature allows incorporating a report within another report, that is, one report can be a subreport of another. Subreports help us keep report designs simple, as we can create many simple reports and encapsulate them into a master report. 15. What is csrosstab report in iReport? Crosstab (cross-tabulation) reports are reports containing tables that arrange data across rows and columns in a tabular form. Crosstab object is used for inserting a crosstab report within the main report. Crosstabs can be used with any level of data (nominal, ordinal, interval, or ratio), and usually display the summarized data, contained in report variables, in the form of a dynamic table. Variables are used to display aggregate data such as sums, counts, average values.